A world where magic and technology vie for dominance is in peril. Three teenagers, Plexi Jata Solaris, Mona Deluvius and Yingjie Iffing are thrust into the line of fire in a war between dimensions. Plexi’s world is populated by the gifted, who yield magic, and the Mundanes, who do not. The powerful wizard T’navreskrad from another dimension manipulates the twins Zarin and Yarin Darsus from Plexi’s world into opening a dimension rift. This evil wizard and three servant magicians pass through the breach to launch an invasion. 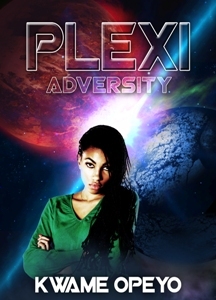 Plexi and her group enlist the aid of a high-grade wizard from their own world to aid in combating this evil. A battle of mystical forces ensues with casualties on both sides, resulting in an apparent victory by Plexi and her friends. Unbeknownst to them though, the invading wizard engineered the battle as a smoke screen for a hidden agenda. Although Plexi: Adversity is a work of fiction, I have experienced more to life than the mundane. Other layers of reality exist outside of our artificial constructs and it is up to us to access them. I thoroughly enjoyed bringing Plexi to life after being inspired by creators such as Gene Roddenberry. His Star Trek universe of diverse characters is what made me fall in love with science fiction/fantasy. Together we can make a better reality by releasing our inner magic.